Sleep is one of the most important things for the human body to function correctly, but more and more of us are not getting enough of it and are not 100% comfortable. Pillows are often overlooked as a way of improving sleep until the creation of memory foam pillows. Every year there's a new type of pillow that enters the market and threatens to become the next best selling pillow. However, there's one type of pillow that has remained a favourite for many years, and that's the memory foam pillow. They may not be as cheap as traditional feather pillows, but millions of users around the world have testified to their effectiveness; however, Latex and Down pillows are slightly pricier. If pillow types were ranked by price to satisfaction ratio, memory foam pillows would be up there with the best. Choosing a memory foam pillow is not something you want to leave to chance as it can quickly become an expensive failure if you choose the wrong one. This guide is set out to simplify the buying process and streamline the process, so you don't waste hours, because let's be honest, who has days and days to devote to buying a new pillow? This guide is especially useful if you are new to memory foam pillows as it includes a detailed buying guide, reviews and additional relevant information. There is a vast range of choice, but there will only be one that perfectly suits your individual needs and preferences, so continue reading as we bring you the best memory foam pillows. Tempur was the first company to commercialise memory foam and bring it to market allowing the everyday consumer to benefit from the superb level of support and comfort that it offers. The Tempur original pillow features an ergonomic design that contours to the exact shape of your neck, head and shoulders to relax and alleviate any pressure. It also works to align your spine whether you sleep on your side or back. There is a reduced risk of triggering allergic reactions when using the pillow because the memory foam is hypoallergenic. Unlike many other memory foam pillows, this does not leave you overheating as the pillow is well ventilated. The pillow comes complete with a removable pillowcase which is covered in a soft, lovely material. The cover is strictly regulated during manufacturing and has been tested for harmful substances and poses no threat to your health. The pillow can also offer some additional relief if you currently suffer from snoring or other breathing respiratory problems. The Tempur memory foam pillow is also great for relieving any existing neck soreness that you may be suffering from as it cradles the head more securely which leaves you feeling more refreshed in the morning. The Tempur Original memory foam pillow is the best memory foam pillow that is available. It is considerably more expensive than a traditional pillow, but it brings so many more benefits. Although memory foam pillows don't work for everyone if you're going to try one we'd recommend you try this one. Introducing the UK designed original Panda bamboo memory foam pillow which is constructed with a triple layer of moulded memory foam which conforms to your body to provide the ultimate support and comfort. Bamboo is naturally a woody, hard plant that converts into a soft and comfortable fabric. The primary qualities of this fabric are that it's extremely soft and creates a cashmere feel due to being twice as soft as regular cotton. Unlike traditional memory foam which overheats, The Panda pillow has built-in temperature regulating technology that keeps the pillow warm during winter and cool throughout summer. The temperature is regulated by the highly breathable bamboo pillow cover that allows air to flow through it freely. The wicking and odour resistant qualities ensure that your body is kept cool and dry. As expected, the pillow is hypoallergenic and dust mite free. Also included is a bamboo cover which has antibacterial qualities and has a silky smooth feel yet can also be easily removed and machine washed. Every Panda pillow comes with a 10-year manufacturer guarantee, and this can be redeemed in the form of either a 100% money back refund or a replacement unit. They say the proof is in the pudding, and this pillow has produced excellent results for hundreds of users around the country. This is especially effective if you don't like how soft traditional pillows are or you regularly sleep with two pillows because just one panda memory foam will do the job! If you already use a memory foam mattress , then this will also be a great addition to enhance your sleeping experience further. The Quiesta memory flake pillow is manufactured using 100% Visco shredded memory foam and is covered with a bamboo air flow case which is soft to touch. The washable case is constructed using a bamboo and polyester blend to bring the most luxurious feel and can be removed to be machine washed. The pillow interior is breathable to ensure that you stay cool throughout the night because air can flow through the whole pillow, unlike regular memory foam pillows that prevent air from flowing freely through it. The pillow is even delivered in style and comes in an eco-sensitive vacuum sealed carry bag. The great thing about the pillow is that it has the firmness of memory foam but the softness of down, so you get the best of both worlds as it supports and cradles your head and neck, so you don't wake up with the dreaded neck stiffness. The foam flakes allow you to sink into the pillow slightly. The Quiesta pillow has great pressure relieving qualities, and it has favourable reviews not just from consumers trying to avoid pressure and pain build up, but also those who have to reduce existing pain that they're experiencing such as prolapsed discs. Many customers have also stated that this pillow doesn't come with the usual odour that usually accompanies memory foam products which means that you can begin to use the pillow almost instantly once it has returned to its original shape. Silentnight is a household name in the mattress industry and has extended its range into pillows. This Silentnight Impress memory foam pillow is an excellent supplement to the Silentnight Impress memory foam mattress topper. 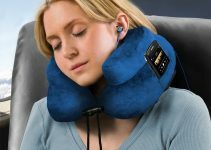 The pillow is made using 100% temperature sensitive memory foam which works to reduce the pressure and neck pain. It senses when you lie on it and works to contour itself around your body using its ergonomic shape. It can retract back to its original state once you have finished using it. The pillow is ideal for back or side sleepers due to its height as you will require additional support that is provided by this pillow. The pillow is hypoallergenic reducing the chance of experiencing an allergic reaction which gives you the peace of mind, and you can sleep in peace. Included is a removable, washable cover, so you ensure that its bacteria free. This pillow is effective at reducing joint pressure build-up, helping to ease aching muscles, joints and back pain, so you wake up in the morning feeling revitalised. Like all memory foam pillows, if this is your first time, it will take a couple of nights to get used to the difference in firmness. Once you have slept on it for a couple of nights, you will see how quickly it transforms your quality of sleep. Enjoy a relaxing sleep with the Foksal memory foam pillow which is constructed using high-quality Visco memory foam which brings a soft firmness and perfectly embraces the shape of your neck and head every time you sleep. This memory foam pillow is truly multi-functional and can be used no matter what type of position you sleep in and can be used by pregnant women to sleep comfortably. Not only is this pillow backed by a 90-day money back guarantee but it also has a two-year warranty included in the purchase should it not meet all your needs. The pillow is covered in a hypoallergenic cover which is dust mite resistant, so there is little chance of an allergic flare-up. The pillow also regulates heat to help your body maintain an optimum temperature without overheating so you can experience the most comforting sleep. With the included guarantees this is a risk-free purchase, although it isn't the best memory foam pillow on our list. For us, it doesn't have the level of firmness that other memory foam pillows have, as they try to bring the best of soft and firm pillows together which may not be to everyone's liking, especially if you're after a firm pillow. But if this blend of firmness sounds ideal, then this product could be perfect for you, especially if you sleep on your back. Memory foam is a unique type of material called Polyurethane that is sensitive to pressure and reacts to changes in temperature which contours and moulds around your body. NASA first created memory foam for use on their spacecraft by astronauts to ensure that they experienced the best rest possible and to increase cushion safety. Over the years it quickly made its way into the commercial world and became readily available to the everyday consumer. In the case of a memory foam pillow, it moulds around the shape of your head, neck and shoulders to provide a lovely comfortable feeling. This prevents you from waking up in the morning feeling sore, tired and irritable. Memory foam is usually a large block of viscoelastic foam; however, this has been developed into a Contour pillow which features a small groove and several ridges running horizontally through the pillow. The subtle groove helps to cradle and support the head and neck, and due to this it's one of the most popular types of memory foam pillow, and it is an extremely popular choice for those that suffer from neck pain and is commonly used by back sleepers. The shredded memory foam pillow has a similar shape to a traditionally sized pillow and has a similar height so it is suitable for all types of positions that you may sleep in. They have been named shredded because its interior is constructed using thousands of small shreds of memory foam which is then tightly packed together. The main benefit of this creation is that it's more breathable than traditional memory foam pillows which means that air can flow through it, so you don't become overheated when sleeping on it. Traditional memory foam pillows are usually cut into a solid block rectangular shape which is cut down to your required size and shape. This is regarded as the entry level type of memory foam pillow and doesn't bring quite as many benefits as the other types but is slightly more affordable but still provides increased support to the neck and shoulders. The wedge memory foam pillow has many uses by a range of different people. It has an unorthodox shape, featuring a gradual slope and is shaped like a large triangle and can be used to wedge the body up. Due to being made from memory foam, it can naturally conform to your body which makes it comfortable to lay your back on. While the average person doesn't usually purchase this type of pillow, it can bring great relief to people suffering from medical issues such as acid reflux, sinus problems or respiratory issues. Women most commonly use wedge pillows during pregnancy as it can be used to provide support to the bump when sleeping to relieve pressure and improve comfort. Hypoallergenic - Viscoelastic foam has unique properties that mean the pillows are rated as hypoallergenic. This means that you have a decreased chance of experiencing any allergic reactions such as asthma when using the pillow. In addition, it also reduces the likelihood of mould build up or dust mite infestation. ​Spinal Alignment - Memory foam has the great ability to reduce pressure and the force of gravity that acts on your body. This enables your spine to remain perfectly aligned in the correct position during sleep to ensure your spine stays in the best state of health. Pain relief - Not only is memory foam great at preventing muscle and joint soreness, but it is also effective at relieving the pressure and pain especially if you're experiencing neck, shoulder or back pain. This is because the memory foam allows your body to comfortably sink in to as it contours and conforms to your body. Firmness - Memory foam is designed to have a firm feeling to it, which is great for providing support. This is different to the traditional type of pillow you may be used to which is plush and soft. Additionally, unlike traditional pillows, it doesn't develop lumps. Hygienic - It is incredibly easy to keep pillows clean and free of bacteria. Memory Foam pillows are either machine washable themselves or they have a removal pillowcase which can be machine washed and is suitable for use in a tumble dryer. Support - Viscoelastic by nature is extremely supportive so it will relieve pressure. If its good enough NASA, think of the benefits it will bring to you. Like any type of product, there will be downsides, and while there aren't many significant drawbacks with memory foam pillow, it's important to know everything about a product before you purchase it. Weight - Memory foam is more dense than a traditional pillow which leads to it being slightly heavier. Its isn't hugely heavier but it is noticeable. On average it will weigh 1-2 kg. Price - If you're used to buying traditional pillows, then initially a memory foam pillow will seem expensive especially just for one. But you have to remember you're paying for a better quality of sleep and a longer lasting product. Overheating - Viscoelastic foam is known to retain heat throughout the night when you're sleeping on it. Of course a hot pillow can provide discomfort. New models of memory foam pillows have combated this by using ventilated foam or shredded foam that is breathable. Choosing the best memory foam pillow can be confusing, but now you've made it to the end of this guide you now have all the tool and knowledge to purchase the best memory foam pillow that fits your requirements. Don't settle for an old sagging pillow and get the supporting and comfortable pillow you deserve.